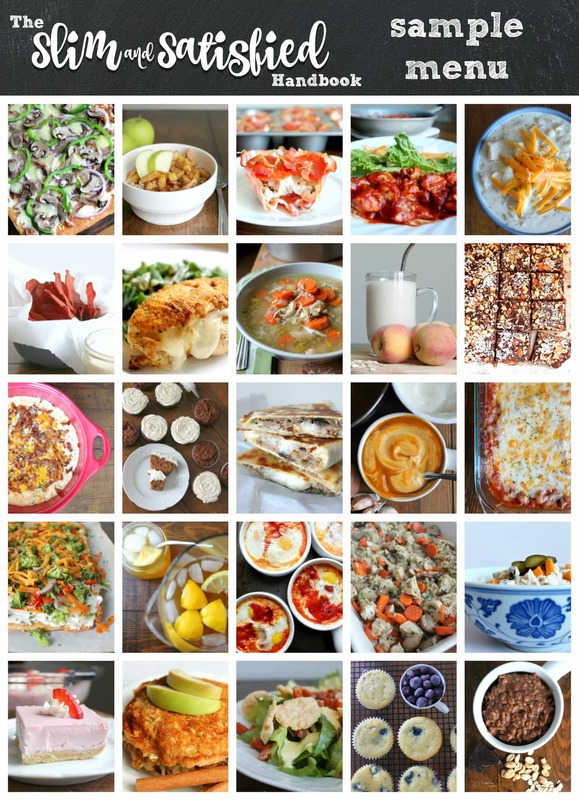 I’ve chosen over 50 of our family’s favorite Low GI recipes for this Menu Plan! Here’s a sneak peek at some of them to whet your appetite! “As a homeschooling mama of seven, I dread menu planning. 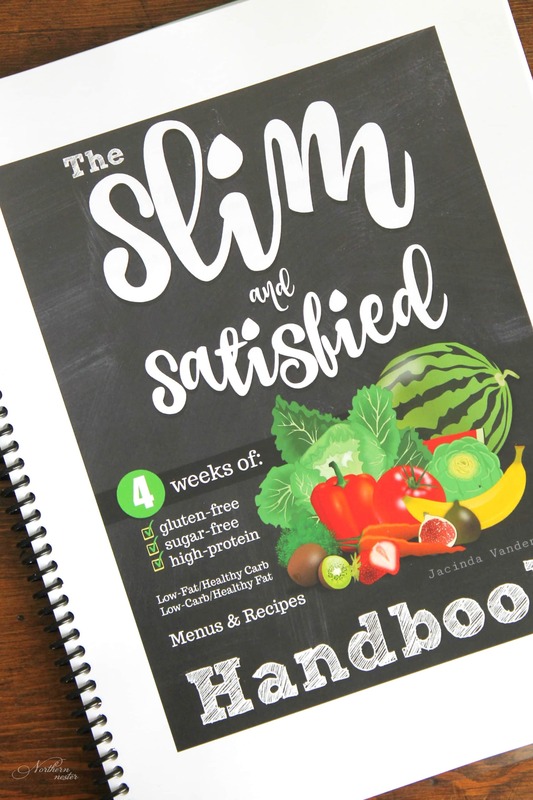 “Slim and Satisfied” is a time (and money) saver, providing fresh meals and snacks in an easy to read plan. 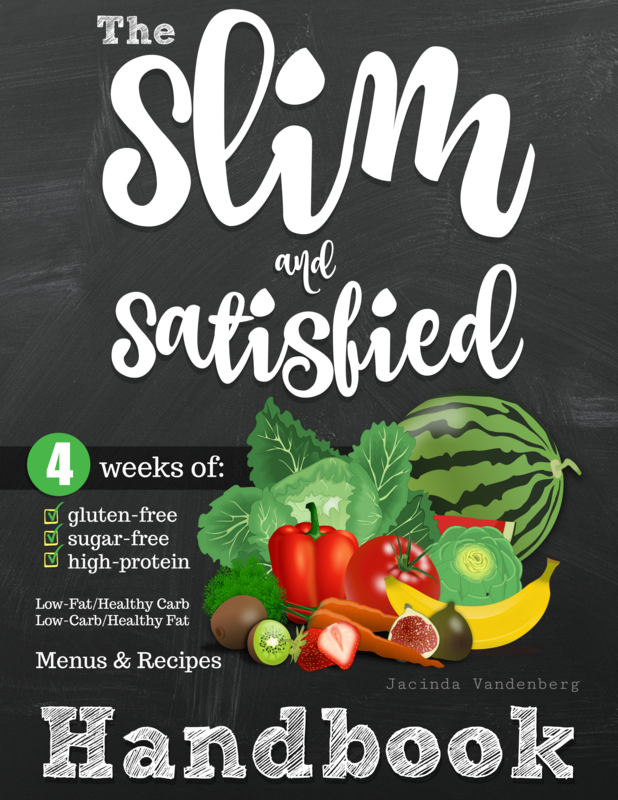 Clearly explained, and delightfully presented, “Slim and Satisfied” is exactly what I’ve been searching for! No special ingredients, and no confusion on what to eat when. Jacinda provides a detailed guide to eating healthy without sacrificing hours searching for meals and kitchen prep! I was hoping it would win me over with scrumptious, uncomplicated recipes and I was not disappointed!” – Stephanie H.
I love this! I was first wondering if it was THM friendly, but I think that I’m seeing it is. Secondly, will it ever be available in s spiral bound book as it appears in the pictures? I’m one who needs to actually hold the book, not online and the computer is not always available to me because of homeschooling, and I’m not able to print it all off at home right now. Thanks for your help! Congrats! Tamara, what I plan to do is put this on a flash drive and take it to our local copy shop to be printed and spiral bound. I also had my THM cookbook spiral bound as well. It makes it easier to keep open when following a recipe. is there an easy way to make these crossovers for the rest of the family so we don’t have to make them other things to eat? I am excited for this (and I am a hesitant buyer of ebooks in general) because it’s written by another Canadian so will have our available ingredients in mind. One thing I couldn’t tell from the post was the recipe size. Are the recipes for one person? 2, 4, etc? Thanks. I don’t know if you got this question answered, and this is a pretty late response anyway, but I just got the book and am flipping through it, and it looks like most of the main course recipes are for 4-6 with some 8 and 12 serving ones thrown in, I’m guessing for leftovers? Ordered yesterday and started today. Very good so far! Thank you for this, it is very helpful to me. And I have to say I was kind of hesitant to try the spicy sweet potato soup, but OH MY is it delicious! Thanks again! Sweet potato spicy soup and the coconut cereal yumm!!! I purchased this plan and have lost 7 lbs. the first week! I’ve been following the THM eating plan for a few months but not with these results. Thank you so much! I purchased and printed your fantastic Slim & Satisfied, and I LOVE it! I’m diving into the recipes today, but have already found the grocery list to be super helpful. It’s been great to rediscover your blog! You’re as beautiful and creative as ever. My wife heard about the THM diet from one of the Health Technicians at a light therapy clinic she goes to. She and I decided to try the diet and bought the Trim and Healthy Handbook a few months ago. We are loosing weight quite well and (we are also diabetic) I had to reduce the amount of insulin that I take in-order to keep my blood sugars where they belong. Actually I needed to stop using my quick acting insulin and lower my long term insulin. When I ordered the Trim and Healthy Handbook I missed the expire date for the download, would you be able to re-open the link so I could download the book?